Lemon pickle Pare a dozen Lemons very thing #, cut them in three or four places quite into the pulp, stuff them with salt, let them remain three days then dry them before the fire till quite hard. Take vinager enough to cover them, boil it with half a pint of mustard seed bruised and tied in a bit of muslin, some slice ginger, whole pepper and a few cloves of garlick or shalot when cold pout it over your Lemons into a stone Jar, they must always be kept covered with the pickle by adding vinager as it wastes, It will be fit for use in three months. # Let the rinds of the two remain on. 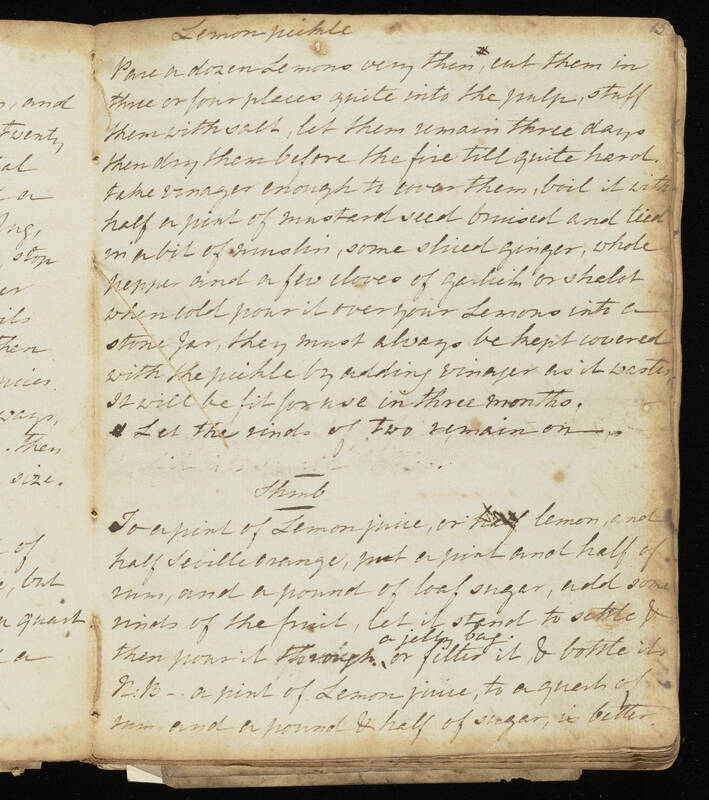 Shrub To a pint of Lemon juice, or lemon, and half Seville orange, put a pint and half of rum, and a pound of loaf sugar, add some rinds of the fruit, let it stand to settle & then pour it through a jelly bag or filter it, & bottle it. N.B. a pint of Lemon juice, to a quart of rum, and a pound & half of sugar, is better.